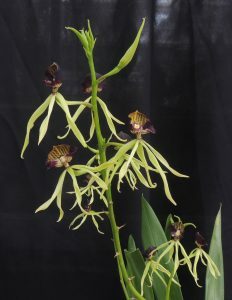 This is an orchid that is always in flower. There hasn’t yet been a day in the last 12 months when we have been without a plant in flower and I am sure that will continue, Saying that we have several different clones that are at their best at different times of the year. The one above has smaller flowers and shorter stems and is its best in early summer. 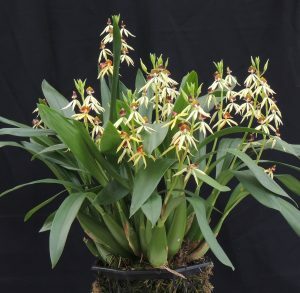 The plant below has larger flowers on longer stems and is more of an all year performer. 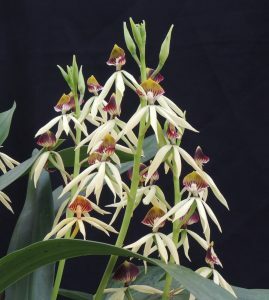 As well as continuous flowering the species is special to the Orchid Project as it is a species we have seen in the wild both in Guatemala and Belize and so it is a species we know very well. In Guatemala we found the species growing abundantly in the hot dryish forests around Yaxha and on plant in particular on the edge of the cliff overlooking the lake has provided a key to successful culture. The plant and its habitat are shown below. 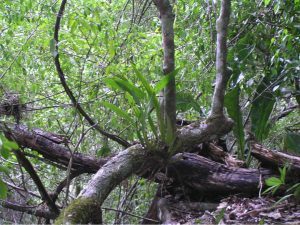 The plant is growing near the ground on a live tree made horizontal by hurricanes and the position is open but shaded. There is some moss on the trunk showing that this spot is a little damper than most of the surrounding forest (probably due to morning mists condensing on the cliff edge) but most dramatic was the size of the plants root system. We recorded roots extending over 1.5m in either direction from the plant representing both considerable mass compared to the leaves and bulbs, and an extraordinarily effective moisture gathering system. This shows that although the plant comes from a dryish habitat it enjoys frequent watering in cultivation as our roots are no match for the wild ones. It is also very apparent that none of the wild plants we found had shrivelled bulbs. 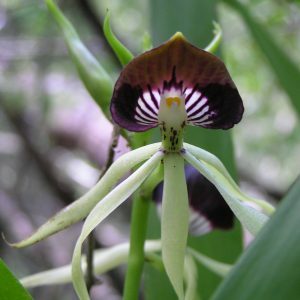 In Belize the species (known locally as the Black Orchid) is the national flower and it was a pleasure to see it again on our visit to Belize in coastal forest along rivers and in large evergreen trees further inland. 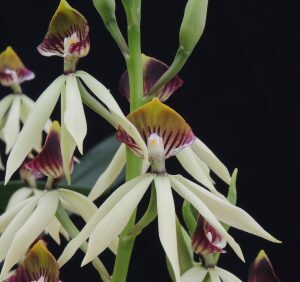 The species is found across Central America, the Caribbean and into North America and this wide range has resulted in considerable variation within the species – a good excuse to grow several plants of this wonderful orchid. The range also extends away from the hot lowland forests and up to 1900m and so it is not fussy about temperature. The species is pollinated by large butterflies that grab onto the protruding lower part of the lip (we like to call them butterfly handles) and then follow the radial lines with their proboscises to the nectar.